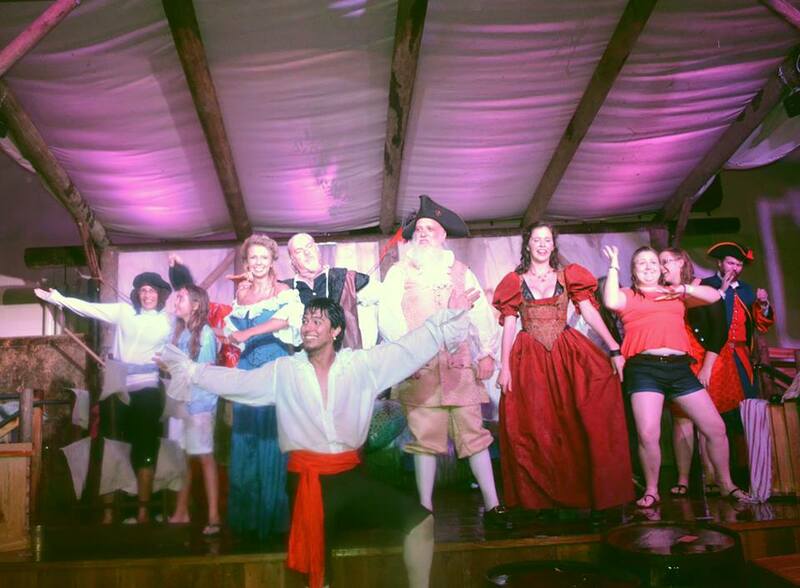 Friday night I was privileged to be invited to the first showing of the new Colonial Crew Revue. A happy crowd milled about finding their seats at the tables beneath the giant Colonial Oak in the new Colonial Quarter off St. George Street. Lanterns lit the twilight sky and it felt like we might really have been transported back a few hundred years. In a city filled with history celebrated often and with enthusiasm, we were going to get a glimpse into a lighter part of that past. Into the humor, the laughter, the entertainment. Instead of the bloodshed and battles, we were going to enjoy a lighthearted look at a troupe of traveling players from a bygone era. 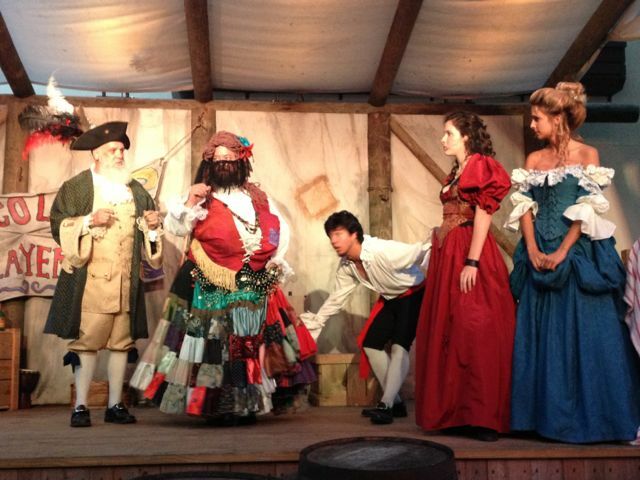 The Picolata Players didn’t disappoint. They were marvelous, one and all. The music was wonderful and the comedy most amusing. When the first few drops of rain began we were all having such a grand time, we refused to believe it could continue. But continue it did, growing steadily heavier. Many retreated to the shelter of a nearby veranda, many put umbrellas up, some just laughed, stayed put and got soaked. Even the players were wet, but it didn’t dampen their performance or the enthusiasm of the audience. 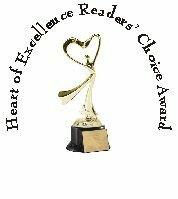 The Ancient City Romance Authors Hearts of Excellence Reader's Choice contest deadline is fast approaching. If you had a romance novel published in 2012 be sure to visit the chapter website (www.acrarwa.com ) and find out how to enter. Award winning author, Elizabeth Sinclair, author of the Hawks Mountain series and more than 20 other novels talks about this prestigious award and how it helps both writers and readers. One of the stated aims of Romance Writers of America is to assist romance writers in their goal of having careers. One of the ways RWA does this is with contests and awards. As a former officer in RWA and co-founder of the Ancient City Romance Authors chapter, can you share a little about how contests can help a published author? Contests (particularly those judged by readers) are an excellent way to get an author's name and books out to readers who haven't discovered them yet. They read for the contest and realize they like this author and then go out and buy their backlist as well as look for any upcoming releases. ACRA's contest is geared to publicize the winners in any way we can. We announce the winners in the Romance Writers of America monthly publication, the Romance Writers Report, thus giving the author more PR exposure. In addition to the above, ACRA gives the author a winner's clip to put on their website. This year we hope to include a list of the winners and runner-ups in our conference program so the attendees can take it home and hopefully purchase some of the books. Tell us about the history of ACRA's Heart of Excellence Reader's Choice contest? When the Heart of Excellence was first conceived, we wanted a contest that could reach out to readers and perhaps help our authors and those of entrants from other chapters make sales they would not have made without it and to recognize excellence in romantic fiction. That's why we decided to make it a READER's Choice. Our readers come from all walks of life and are everyday people. Readers are the ones who put down their money for our books and what better way to acquaint them with talented authors they've never read before than by placing a free book in their hands through a contest? The contest has run for four years and has successfully garnered new readers for many authors. Last year your book, Hawk's Mountain took first place in the Short Contemporary category in the Heart of Excellence contest. Has that had any impact on the success of this new series? After Hawks Mountain won a Heart of Excellence Award, I noticed a definite upsurge in sales of that book as well as its sequel, SUMMER ROSE. How should a published author go about entering? Is it complicated and does ACRA accept e-book and self-pubbed entries? This year, to make certain all romance books are included, the contest has been opened up to e-books and self-published books. Entering is easy and fast. Just go to www.acrarwa.com and click on the Heart of Excellence tab in the toolbar. Remember - the deadline for entry is June 15th - don't miss the chance to bring this lovely trophy home to your bookshelf. Elizabeth Sinclair sold her first romance, JENNY'S CASTLE, in 1993 to Silhouette Intimate Moments. Since then, this multi-published author's 23 books have sold in ten foreign countries and been translated into seven foreign languages. Her books have won The National Reader's Choice Award, The Romantic Times Reviewer's Choice Award, and Maggie Award of Excellence. She has also won a Gold Medal Top Pick from the Romantic Times Book Club and a Holt Medallion Award of Merit. She is a co-founder and member of the Ancient City Romance Authors of St. Augustine, FL, and has been a member of Romance Writers of America since 1989. Elizabeth served as RWA's Region 3 Director and chaired the 2001 RWA Annual Conference in New Orleans. She has presented numerous workshops on the craft of writing and authored the THE DREADED SYNOPSIS. Elizabeth has published a total of twenty-three romances with Silhouette, Harlequin, Kensington, Thorndike and Bell Bridge Books. Her upcoming releases from Bell Bridge Books are HELL BENT, a romantic suspense, and WINTER MAGIC, the fourth book in the HAWKS MOUNTAIN series. Previous Books in that series are: HAWKS MOUNTAIN, SUMMER ROSE and FOREVER FALL. 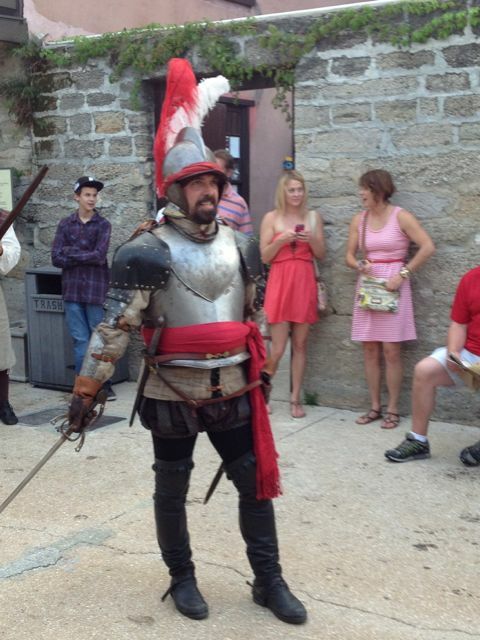 This past weekend was the 27th re-enactment of Sir Francis Drake’s 1586 raid on the Spanish outpost of San Agustin. 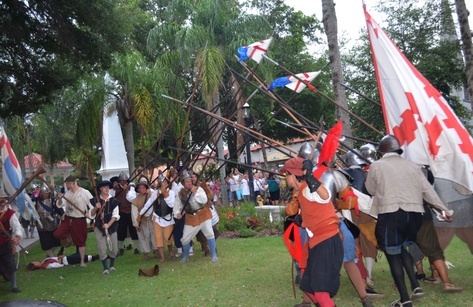 It was done with all the enthusiasm and attention to historical detail that is so common in current day St. Augustine, and included a weekend encampment at the Fountain of Youth representing the city as it was in the 16th century. A bonus for visitors to our city. I volunteer on Saturdays at the new Colonial Quarter which tells three centuries of history from the earliest beginnings through the colonial period. The raid re-enactment wasn’t scheduled until 7:00pm and I finished at 5:00 so I decided visit the Taberna del Caballo, which is part of the Quarter but open to anyone who cares to come in off St George Street for a drink or a bite to eat, or both. Like stepping back in time to the 18th century, this candle-lit tavern is typical of the 40 or more taverns that existed in this Spanish Garrison town. I hiked myself onto a stool and ordered a beer and found myself chatting with a couple who were visitors to the area. He was a sailor stationed up in Jacksonville and so far this day, he’d had a fantastic time exploring St Augustine and many of the attractions it had to offer. I asked him if he was staying for Drake’s Raid. 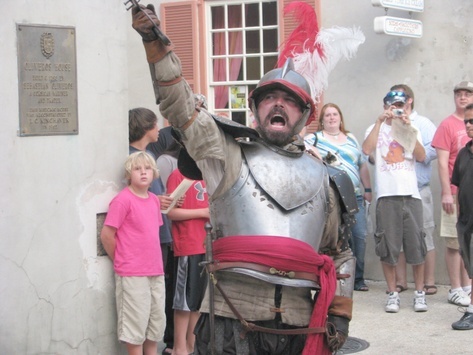 427 years ago on June 6th, 1586 twenty-three ships approached the harbor of the Spanish colonial city of St. Augustine with 2000 Englishmen under the command of Sir Francis Drake. 1000 of these men, led by Captain Christopher Carlile came ashore on Anastasia Island and mounted cannons across the harbor from the Spanish wooden fort and begin to duel with the Spanish forces there. The Spanish were forced to abandon the fort during the night and with daylight approaching on the morning on the 8th the English crossed Matanzas Bay, taking the fortification and proceeding to drive the Spanish from the city of St. Augustine, after which, Drake’s men burned the city to the ground. 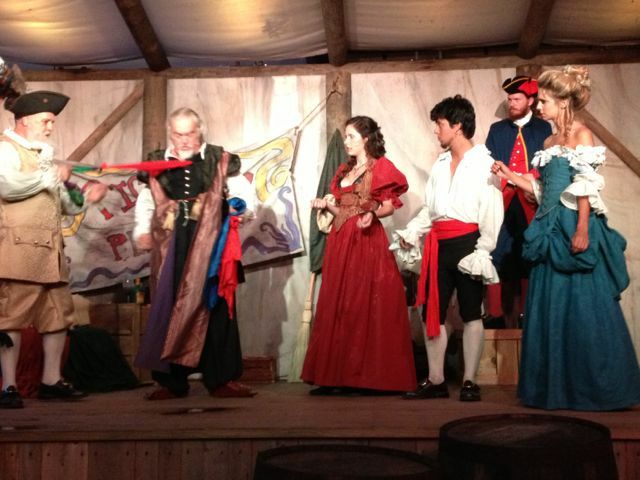 And tonight, I went on, they will re-enact that raid. 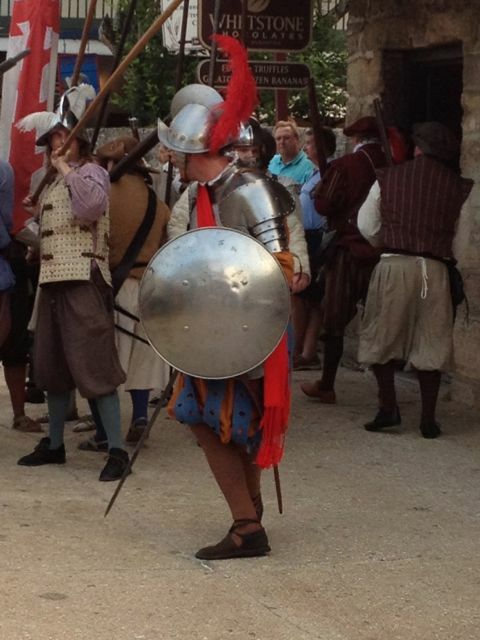 Skirmishing from the city gate to the plaza with pikes and swordfights and the firing of canon and muskets.